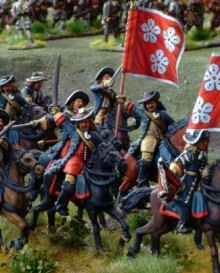 I have rushed up some unpainted shots of the 8 new packs of Musketeers in Firing Line with Apostles. These will cover the period from 1680-1699. There are 5 different poses in each pack and the eight packs represent 8 guaranteed head variants per pose.Swords are seperate and so can be positioned at differetn angles on the hip. They will become available in battalion packs but not for a month or so. Initial stocks are limited but we have them in our possession so will ship immediately with no preorder period.